Kobe beef comes from 100% Japanese wagyu, born via embryos imported from Australia, with at least four generations’ full-blood lineage certified by the AWA (Australian Wagyu Association). Wagyu reproduction and breeding takes place at the Esteutz farm in Hondarribia, where the grass-fed cattle roams freely for 20 months and is fattened for a further 10-20 months before slaughter. Steers, on the other hand, are slaughter within a year of birth. Kobe Beff of ITOMORITAKA Kitateruyasodoi lineage, Wagyu FB breed, raised by Mugaburu farm, provides a sublime experience for the senses compared to other cattle breeds. Mugaburu’s fresh meat is remarkable for its attractive and unique scarlet colour, and its delicate fresh yoghurt-ish or butter-ish taste that brings back reminiscences of the meadows. When properly cooked, Kobe beff is very tasty, with a wonderfully intense roasted or grilled flavour and a slight sweetish note. Mugaburu’s Wagyu beef has a unique richness and ideal stringiness that makes it incomparably succulent, tender and abundantly flavorful, leaving a subtle tang of flavor that lingers on the palate for quite some time. It’s particularly interesting to highlight that the chemical composition of the Kobe Beef from Esteutz differs from that found in commodity beef, mainly owing to its characteristic high monosaturated fat content and its low moisture content. After being examined by the Japanese Beef Grading (Busboom and Reeves), all the samples showed an “excellent” fat marbling ratio (higher than Prime, in a special category the Japanese call “Platinum.”). According to the Beef Color Standard (B.C.S. ), the Beef Fat Standard (B.F.S.) and the Beef Marbling Standard (B.M.S. 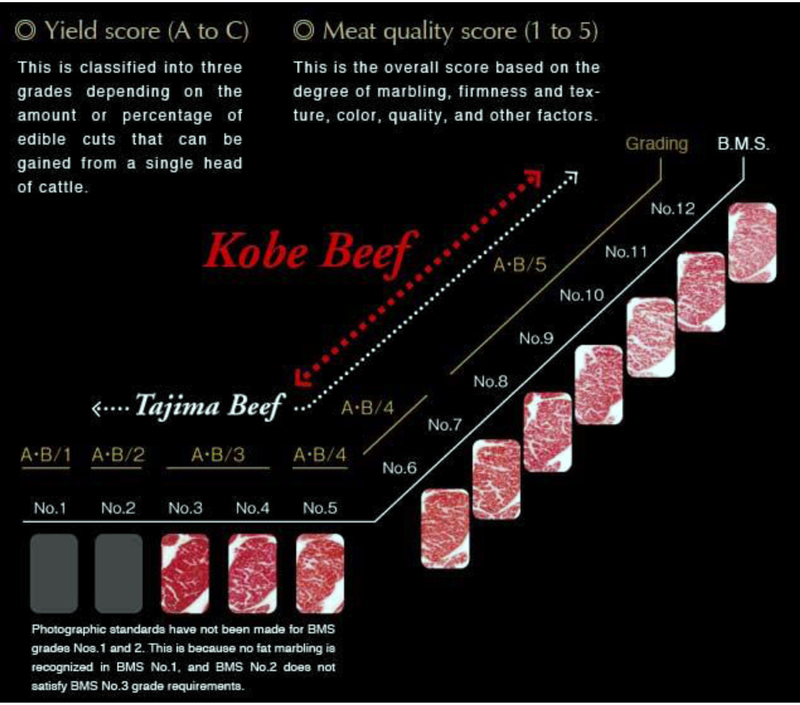 ), the marbling ratio of six samples of Mugaburu beef reach a score of 9-11, on a grading scale of 0-12. After analyzing six samples from six different animals bred at Mugaburu farm, it was noted that Mugaburu beef has a higher ratio of oleic acids (beneficial monounsaturated fatty acids) (39%-42%), and a lower ratio of saturated fatty acids compared to veal meat. In other words, Mugaburu beef has a higher percentage of essential fatty acids than veal meat and is very low in cholesterol. And the composite breeds derived from them. Unless the animal derives from a Japanese breed, it cannot be called “Wagyu”. According to Larry Olmsted, from Forbes magazine, some cattle farmers have imported full-blooded Wagyu cattle to the United States, but few farmers have maintained 100% purity in the heard and kept their Wagyu certified. Olmsted argues that even when the American Wagyu Association refers to the American Wagyu as a “full-blooded Wagyu”, it is actually referring to wagyu-cross cattle. Kobe beef comes from full-blood lineage “Tajima”, which belongs to the Japanese Black breed of cattle (Black Wagyu), one of the four breeds into which Wagyu cattle is classified. Tajima cattle must conform to stringent quality and purity standards. “Kobe Beef,” “Kobe-gyu,” “Tajima-gyu” and “Tajima Beef” are all registered trademarks in Japan. The meat from Tajima-gyu cattle must meet extremely strict standards to obtain certification for “Kobe beef” authenticity. The cattle are fed only the best feed available in Japan: rice straw, maize, barley and other cereals. The meat is prized for its flavor, tenderness and “shimofuri” fat marbling, which means it has a high degree of fat marbling that melts at low temperatures, giving the beef the “melt-in-your-mouth” effect. A mere 3,000 heads of certified beef cattle exist, and they’re all in Japan, according to the Kobe Beef Marketing & Distribution Promotion Association. According to popular belief, Kobe cattle are fed beer. This is false. This myth started 30 years ago, when a Japanese restaurant did a promotional stunt in which they maintained that their cattle were fed beer. The notion that Kobe cattle get regular massages is also false. Nobody knows exactly how this myth started, but no farmer can afford to give their cattle even a 10-minute daily massage before slaughter. It would take a prohibitive number of employees for an average farm of 100 animals, and would not be possible at all for Australian farms that raise more than 1000. Wagyu cattle is Japanese cattle of four main breeds. Black Wagyu is one of the breeds of Japanese cattle. Tajima is a strain of the Japanese Black and the name of a geographical area famous for its high-quality beef. From this Tajima brand, top notch are stamped as Kobe beef. 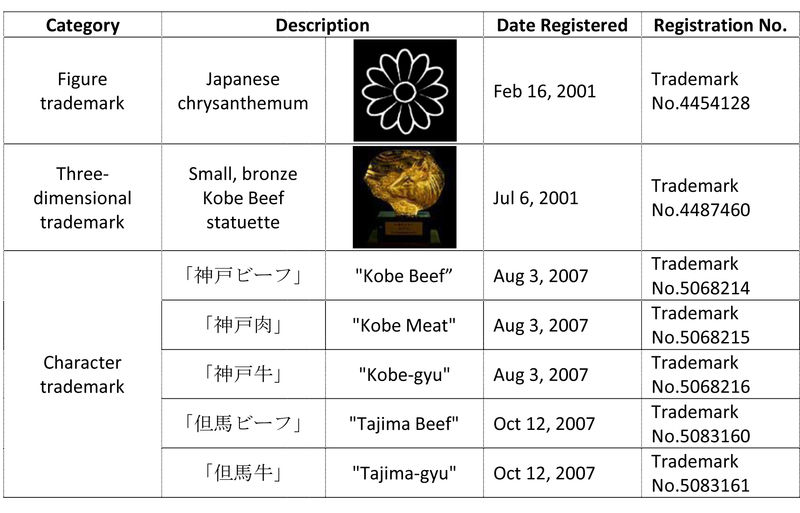 Trademarks registered by Kobe Beef Marketing & Distribution Promotion Association.